It’s where you fish and how much fun your customers have. Today, it was all about keeping it calm. 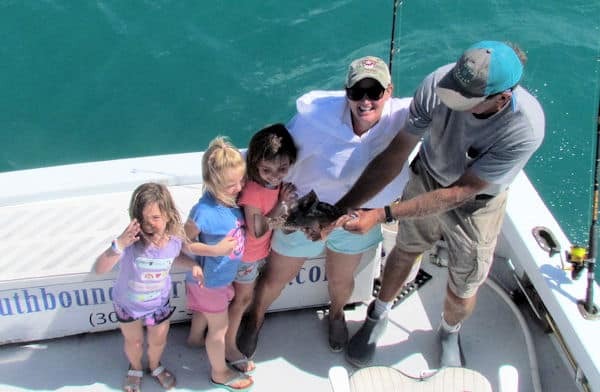 We had 3 adorable little girls out on their first fishing trip. Unfortunately, we had a cold front come through the Keys late last night. That means the wind was blowing strong out of the North West. Anywhere I went on the reef would have been too rough for the little ladies. The last thing I want to do is to have them spend the rest of their lives associating boats and fishing with being seasick. out the reef in Hawks channel, about 2 miles offshore. I’ve fished there before and caught Kingfish, Mutton Snapper, and Mackerel. Unfortunately, it was still about a 2-3 ft sea even that close to the island. I knew the little girls would not last long so we made a move. but after discussing it with the parents, we decided to tuck up tight on the south side of Key West. That’s the Lee side for you nautical folks. That means the island would block most of the wind and not allow the waves to build up before they got to us. I was only about a 1/4 mile off the beach in 15 ft of water. The seas were only about 6 inches, I could not get much closer to Key West without running aground. But It was calm. 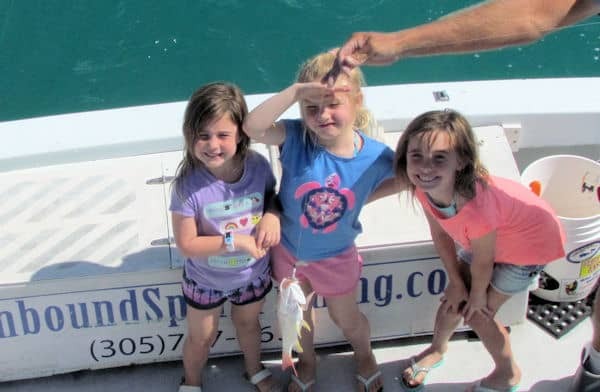 The little girls had a blast reeling in small grunts, Lane Snapper, and Yellowtail snappers.